The Long Island Ducks - baseball that shouldn't be missed! Wanna take your kid to a ball game? The Long Island Ducks are the perfect alternative to major league baseball. I have a shocking confession to make—I’m not a big baseball fan. I know, that’s almost anti-American, but it’s not just baseball, its all sports. I’m just not a fan. Got tickets to the game? Count me out. Unless it’s the Long Island Ducks. Why do I make the exception? 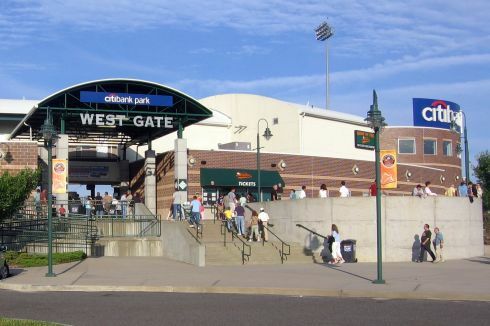 CitiBank Park, home of the Ducks is located in Central Islip making it very easy to get to no matter where on Long Island you’re coming from. Since the stadium is much smaller than your standard MLB stadium, you won’t have to fight traffic getting to or leaving the game. CitiBank Park is small and intimate, so no matter where you sit you’ll have an excellent view of the game. Tickets are very reasonably priced ranging from $7 for standing room only to $13 for club seats. Concession prices are also much lower than what you’d pay at a Yankee or MET game. For a little over $8 I get an imported tap beer and a burger. The Long Island Ducks are what’s known as a Double-A team which means they play darn good. So good in fact that several players have moved from the Ducks directly into the majors bypassing the usual stint in a Triple-A team. What that boils down to is that the games are exiting. You’ll see great pitching, hitting and field work. Seeing the Long Island Ducks at CitiBank Park is a wonderful baseball experience. The intimate stadium, the inexpensive food and drinks, and the lack of traffic make seeing a live baseball game a pleasure rather than an ordeal. Never been to a Duck game? Check it out, you won’t be sorry. The last time I went we had a 59 minute rain delay. That sounds like a long time, but it wasn't really that bad. I mean, hanging around with friends at a ballpark, how bad could that be? On this particular night the Long Island Ducks were playing the Bridgeport Bluefish, a team they narrowly defeated for a playoff spot a few seasons ago. Would this be another close game, I wondered? From the minute the game started I knew the Bluefish were in trouble. Compared to the Long Island Ducks they were playing like a high school team. The ducks scored 3 runs in the first inning, while Bridgeport managed 1 run in the second. The third inning brought the Long Island Ducks 5 runs, making the score to 8 - 1. Hardly the close game I was expecting. Around this time Bridgeport’s pitcher was getting sloppy and actually hit three of our batters. At one point it looked like there might be a fight. But the Long Island Ducks maintained their professional composure and just played ball, eventually winning the game 10 - 1. If you like baseball maybe you enjoy fishing too. Check out Snapper Fishing on Long Island and what to do with Dogfish and Skate.